Writing thank you cards is always a wonderful gesture to let someone know you appreciate what they did for you. 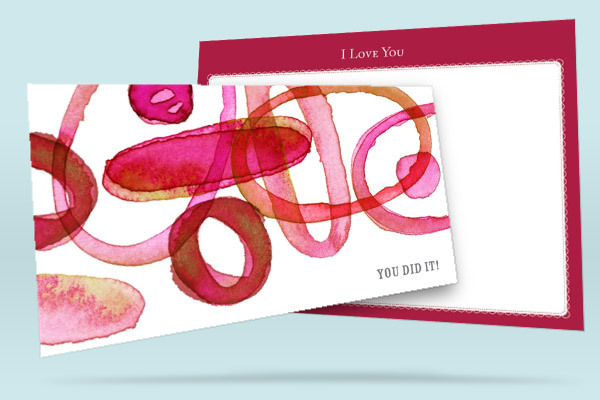 But not every occasion requires a “thank you.” Sometimes you want to say, “you did it!” or “remember when…” or “I love you!” So why not create your own personalized note cards that say that? If you had a variety of stationery ideas to pick from that fit different occasions, not only thank you cards, but congratulatory cards and encouragement cards and love cards, we’re betting you’d write a lot more notes. You could tell your husband about how happy he made you feel when he brought you coffee at work by writing him a “You make me smile” card. You could stick an “I love you” note in your kids’ lunch box as a little surprise. You could send a note to your niece congratulating her on her first goal in soccer with a “You did it!” card. Sending handwritten thank you cards is very important, of course, but there are other events to acknowledge and other words you can use to put a smile on someone’s face! See our note cards collection for lots of stationery ideas including, but not limited to, thank you cards. And never underestimate the power of the pen.